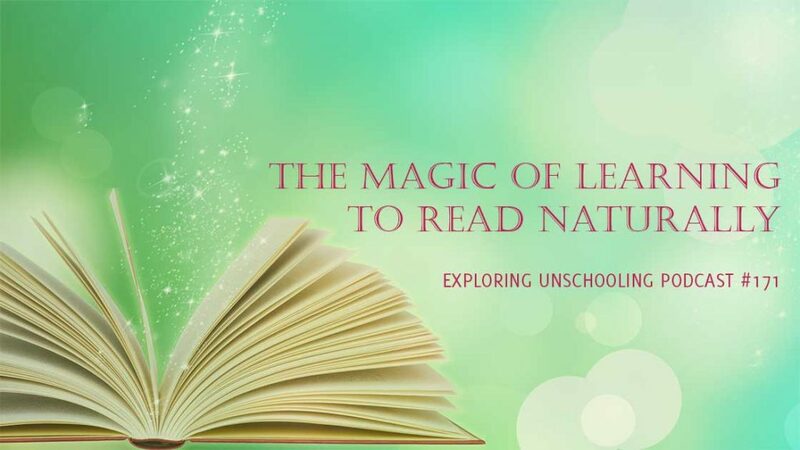 For this compilation episode, I gathered clips from ten different episodes in which guests shared their stories and insights around unschooling and learning to read. JOYCE: Schools have become freakishly obsessed with kids and reading, as though learning to read were barely doable without experts of guiding it. They’re making parents freakishly frightened. Learning to read is hard in school. Out of school learning to read is as natural and effortless as learning to speak. It’s easier in fact, because when kids learn to speak they don’t even know what language is, yet in three or four years they’ve mastered it. After that it’s just refining the details. But learning to read is almost a matter of matching the spoken language to the squiggles on the page. At least the child has the bulk of language down before they start reading. But learning to read involves decoding. There’s some steps the brain needs to do to match the spoken words with written words. So how a child does that is different for each child. Some build from letters up. Some build from whole words down. But whatever the process it’s like learning to walk. Parents create the environment and kids figure out how to make their legs work. also like with walking reading doesn’t happen until the brain is developmentally ready. Once the brain is ready, like with walking, kids can read. Some kids report it’s like a light switched on. For most it’s a little slower but either way all unschooled kids learn to read in support of a print rich environment. The most important aspect of learning to read is having positive experiences with what reading is for. Reading is like a doorway. School focuses on the doorway but the door isn’t all that interesting. The things that lay beyond the door are interesting and when kids are exposed to what lays beyond the door, they’ll want to go through. The most helpful thing a parent can do to support a child learning to read is positive experiences with words. Reading books is important but, just as important, is stopping when the child is done. If the purpose is learning to read, then all words are important—not just the ones in the books. A McDonald’s sign is important. Game instructions are important. Anything the child wants to tap into that’s printed is important. Also anything connected to reading: all forms of storytelling, movies, TV, puppet shows, plays. Storytellers connect the kids with what reading unlocks rather than focusing on the key. 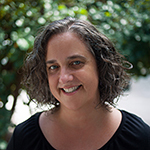 PAM: School and by extension, society, is very laser focused on children learning to read as early as possible. As a rural library director and unschooling parent, I would love to hear your perspective on how you have seen these reading expectations play out. ANNE: Well, first of all, I love how you said rural library director, it is like the hardest three words to say together. Of course, when we have any expectations on our children and we do not trust in them to live and learn in their own way and in their own time, they can feel that. So here we are an entire society which does include school and libraries where I work, collectively holding this expectation about children reading early and often. Not only holding that expectation but creating programs and incentives and rewards and punishments around this expectation. If we back up to see why society does this, it is really obvious: schools need children to read. A quick Google search will tell us that reading early has a direct correlation to academic success. Of course it does! How can teacher teach children what they’re expected to be teaching without children being able to read? The only method a classroom has to expand a child’s world is by way of reading. There are lots of ways they do that: books, handouts, tests, what is written on the chalkboard. Do they use chalkboards now, still? I do not know. PAM: Some kind of board. ANNE: It is all the written word. So we see how this equation is necessary. The equation being, the expectation of early reading equals academic success. The cool thing is as unschooling parents, we get to remove the academic success part of the equation because that is never our focus. Our focus is on the child the whole child. When you remove academic success there is not an equation any more, the expectation of early reading falls away as well. Now we can allow the child to learn and grow and perceive the world in their own way, in their own time. Offer them the greatest gift we can offer unschooled children and that is trust. 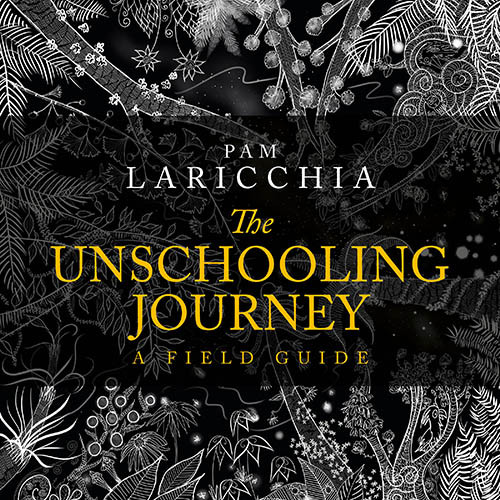 PAM: What was your biggest concern that drove your choice to move to unschooling? I’m a passionate book lover and I knew that if he was just left alone to explore words and books and text and whatever, in whatever way it interested him, reading would come naturally whenever he was ready. And I was really sad thinking that this kid who was so excited and awesome and hilarious and talented and enthusiastic was having a possibility for future love of learning squashed out of him by this experience, this emphasis that school was placing on this skill that he was not ready to learn. I was heartbroken knowing he was feeling bad about himself, feeling bad about his own abilities around the idea of reading. When he would talk to me about it, the message he was receiving was basically you should be able to read these books right now and you are a failure because you can’t. When I think back to it, I think, “How did I let him keep going to school?” Because it’s so awful. It was not the school’s intention. They were just trying to help him, but they are a school. They were like, “You need to learn this by this time.” That’s just how they think. He would even say, “I’m bad at reading. I hate reading.” I was just like, “Oh, this is awful.” So that was my number one reason and then the other real reason was that I felt like I was supposed to be doing this all along and then this moment in our lives opened up where I realized, “Ok, now this is a real feasible time, a real possible time for us to do this, so let’s do it.” So that was a huge motivator. PAM: Yeah, it was something in the back of your mind always and you were paying attention and you saw when those possibilities started to come together. Yeah, that’s cool. And what’s so interesting too is that whole reading piece. That was very much Lissy’s experience at school too. When she came home it was all, “I hate reading. I don’t want to read. I can’t read.” All those messages. And we just made sure to totally back off and it took about a year for her to move through, move past all those messages that she had gotten. She was in second grade when she left too. LAUREN: The same as River, yeah. It’s amazing. It’s like if we could just as a culture look at people, just let them be. They’re going to get it, you just got to leave them alone. It adds all this unnecessary baggage. It’s so detrimental. 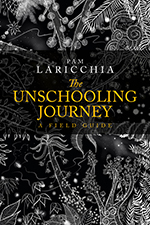 PAM: You have also created a Facebook group called Unschooling as a Tool for Decolonization. I was wondering if you can you explain what you mean by that and how unschooling can be a powerful option when we explore decolonizing education. ZAKIYYA: Okay, so you know decolonizing education is a really huge topic of discussion amongst everybody in South Africa. We’ve had so much of student protest, etc, around that issue. For me, I think we started this discussion earlier because I think, for me, how we learn, that we focus on text and reading and writing, that to me is a very colonial thing as well. I later discovered how colonial it is. I was also really concerned primarily about whether my son could read and whether they liked books and liked reading. That’s actually one way of learning and one way of interacting with the world or interacting with other people’s imagination, but it’s just one way. That’s something that comes from our colonial education. There’s so many other ways of knowing, so many other ways of being. There’s so many stories. We’ve prioritized one small subset of knowledge which really speaks to a very capitalist kind of power. In the meantime, other knowledge systems, indigenous knowledge systems, the diversity that comes with the cultural knowledge of communities is dying because of our emphasis on schooling. Why I think unschooling itself is a potentially powerful tool for decolonization is that, it also can’t be. There’s lots of unschoolers that come into the group worried that their children don’t like reading and look for ways to help them to do that. As an unschooler, we could also say, “Okay. All knowledge is fair game. Let’s not prioritize only with knowledge. Let’s not prioritize only with reading.” Whereas, if, for you, dance is the way you want to express yourself, then that’s how you do it. If storytelling, it’s a big part of African culture and Indian culture, I later discovered, on my trip I discovered. So, why don’t we allow those kinds of activities to come into our world if our children like it? Nothing to be imposed on, but we’re not privileging some ways of knowing some bits of information over others. So, when we talk about the freedom to choose, the options we can choose from is all options and not just looking at one version of history, but looking at all the kinds of histories that could be there. We can reclaim how we want to understand the world and we can take it away from colonial power and create. We can’t go back to what there was, because we’re disconnected from it, but we can create something that’s new and meaningful, and something that’s for a better world, and I think that’s the important thing, that in everything we do it has to look like we’re working towards a better world. PAM: Yeah. I really, really love that perspective on it and the idea that we can not just revisit our assumptions about learning, etc, but our really deeply held assumptions about the more superficial things that we’ve learned—like deeply held assumptions about how human beings can be in community with each other. As you say, the social movements and how we relate to one another but on that deeper level than just our day to day, because we are so caught up in that day to day engagement, but unschooling really does allow us to step back and look deeper at it, doesn’t it? ZAKIYYA: Yeah. That’s the blank slate. “Okay. What is it? What do you want to know? What kind of a world?” Yeah, we can explore all that. PAM: That deeper blank slate. I loved when you mentioned the lens of reading and writing as being the one way or the “best way” to learn things and to communicate between people, because we talk about how kids are going to learn that because it’s so prevalent in our society. But I super appreciated—certainly with Michael, my youngest, because when he left school he wasn’t reading at all. In junior kindergarten, they hadn’t really started that a lot. I got to see for the next eight years or whatever, I don’t know, was he ten, 11-ish when he was reading fluently. That’s another thing. They define reading as it looks in the real world, right? To them, reading is picking up a Harry Potter book and reading it through. It’s not, “I’m reading because I’m doing early readers.” There isn’t that world, but to see his mind at work and how not yet having that fluent reading skill did not get in his way at all. I got to see so many different ways of learning things and sharing things and communicating things. It wasn’t a hindrance in his life at all, and that was a really interesting thing for me to see. ZAKIYYA: Yeah. That is interesting. If my eldest had said that, I would have said, “Oh, this unschooling doesn’t work,” but with her, I knew that there’s no way she could avoid the reading. It’s going to come to her whether she wants it or not and it did. She doesn’t like reading for fun. She said to me, if I tried reading to her, after the second paragraph, “You know, mom, I’d really prefer my own imagination.” What was I supposed to say? “No, this guy’s imagination is better because the publisher published it?” So, I left it, which is really a good thing to leave, because now she just writes very deeply and very imaginatively. A lot of her expression comes from her writing rather than reading. She said she wishes she could do art, but she says, “I’ve accepted I’m not good at it, so I’m going to move on.” No judgement, she’s just accepted. “This is who I am.” Defined it and I was grateful that I had managed to let go of my beliefs and not worry about that she “has to” read and “has to” enjoy and that’s the only way to explore the world, etc. PAM: You wrote a post a few months ago that was all about how we don’t need to rush reading. I was hoping you could share a bit about your journey through the conventional push for kids to read earlier and earlier? JO: Yeah, I think that was me, I mean, intellectually, I was a teacher, and I knew that it wasn’t good to get three and four-year-olds sitting in the classroom and getting them to copy down things, but when it was your own children, I really felt that it was important that they got it early. Everything, not just reading. Achievement for me was always something really important, and it was something that you got a prize for or a certificate, and that was success. That you got this thing and you had it and you were told well done for it. Actually, I think if the girls had been more compliant, we may well have carried on just being really structured and pushy. Luckily, they did not and they wanted to do things their own way, so, like I was saying before, I was the one who had to change. And the reading was part of that. Like, they are into a lot of reading-related things, and we used to read books every day, we don’t always now—we do it whenever they need to, but there are other reading activities around. And as they get older, I thought I’d be more worried about it, but I’m not. Reading and in other things, the more time goes on, the better I feel about it. I can see their language progressing and their storytelling, and they can read pictures and decipher meaning and they make inferences. And they ask me to read things if they need it, for whatever it is that they are doing or they figure out what it says by the context. And all these wonderful, brilliant skills that are part of literacy. And the rest of it will come whenever—whenever! And it helps as well when I don’t compare to other kids, which I used to do a lot. We were around the toddler groups and I used to say ‘oh, they can do this, and they can do this, but we can’t do that, but we can do this other thing…’ And now that they are not part of the system, it’s easier not to do that and that makes me feel better about it all. But I think always with reading, it just seems to be that unless you have a particular desire to want to do it from early on, it’s not helpful to try to make it happen. It doesn’t help anybody and it can be destructive in a lot of ways. PAM: Yeah, I think that destructive piece can really get in the way. And I remember something that was really eye-opening for me as my kids were reading later. Because, you think ‘reading is so important!’ And, ‘they need to be able to read to do just about anything!’ Right? JO: That’s the thing. Yeah, yeah. PAM: And yet, what I started to see when I was paying attention, was that that lack of reading was not actually impacting them. I mean, I would read and help out as needed, but it was so much less needed than I thought it would be. I didn’t have to trail along behind them 24 hours a day, reading everything that they came into. PAM: There’s so many other ways to interact with the world! That was such an eye-opening piece for me. That there were all these other skills that they were developing that help them get along in the world! And it was because in the classroom, in the school, reading is a super important skill that they need all the time, right? For reading textbooks, worksheets, writing down, you know, doing their worksheets, writing tests and everything. But outside of that environment, it was not as important a skill, and they had the room to develop so many other different skills, too, don’t they? JO: Definitely, yeah. It does become necessary in schools because everything is based on what you’ve done previously, and it goes up in that kind of that structured, layered way, and if you haven’t grasped the reading bit, you can’t go on to the next bit. But so many kids I would get, in secondary—I was a high school teacher—would come and they would be able to read the words but they wouldn’t be able to read for meaning at all, and that surely is the thing that we are aiming for. There is no point in being able to read words if you can’t then figure out what it means or try and gather something interesting from it, or even useful or necessary. But because they’ve been through this path, and it was difficult for them, that they had to concentrate so hard on knowing that these letters make up this word, that their brains didn’t have the opportunity to do anything with that other than spell out and sound out the word, and this is when they were 11 and 12, and at that point in the school system it was really hard for them to continue to keep up and without a lot of additional support, which we, you know, obviously tried to give. But it tends to make people get further and further behind this arbitrary place that people ought to be at. JO: All of the other learning that you’re doing. 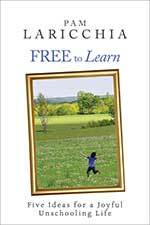 NICK: I think that the whole magical thing about unschooling is watching your child learn how to read naturally. And from being inspired from something they love, with my older two it was a big thing a couple of years ago. They had subscriptions but you had to chat with other people in the group and so they asked, “Hey, we want to read.” It is just truly magical; seeing their desire to learn. Most people are like, “Your kid is 10 and doesn’t know how to read yet,” but it seems like that is the age when my children really had the desire. We never had to force them, we just let it flow, and to see that flow of reading and see it naturally and from a passion, from their desires to learn how to read. 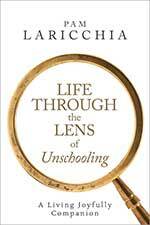 SYLVIA: And another thing that really has helped me in terms of deschooling is being flexible. Understanding that not every kid is going to do everything at the same age. Not every kid is going to do everything in the same order. Something that I was not expecting that happened was that Harry, who is 11 now, learned to read before Gabriella did. Gabriella really didn’t start reading fluently, until she was around 12. And Harry was really reading at like 8 or 9. And it happened gradually, and there was a long period of time where they could read some, and they could work their way through things. They could pass, kind of thing. SUMMER: Yeah. Yeah. So I’m sorry, I totally got off of your question. I tend to go out on tangents like that. PAM: Ahh, that’s okay. I love that. SUMMER: What are some of the other common questions I get? “Well, how do you learn.” That’s the other big question. “Well how did you learn how to read?” That’s my favorite one. “How did you learn how to read?” I get that one a lot. SUMMER: Yeah. Like, “Oh, I was unschooled.” And people are like, “Oh, well what’s that?” And I’ll be like, “Well, you know, we didn’t go to school.” “Is it like homeschool?” “Well, you know, I mean that’s the closest thing to be able to compare it to, but we didn’t actually do school at home. We didn’t have any required academia. We weren’t forced to learn anything at all. We were provided with means if we showed an interest, but there was never any force or requirement.” So people go, “Well, how did you learn how to read?” Like, as if you can’t learn how to read unless you’re forced. And so I like that question because with a family of four, we each learned to read in different ways at different ages. So it’s not like there’s one way to learn. It’s not like there’s one way to learn how to do this thing. It’s not like, “Oh, in order to learn how to read, you have to do it like this.” It’s not like that. It’s kind of like when you learn how to talk. And that’s ridiculous, because every child learns how to speak a little differently. They learn different words first. And they learn at different speeds. And they learn at different ages. Some kids will just start talking one day. Some kids will do a word here, a word there, and will build up to it. Or some of them are like my little brother who really shockingly, at like—he was really little, he was only like a year old—could say anything that you asked him to say. You’d just point to something and he would say it. One day, only for one day. And then he stopped and wouldn’t speak again for months. And then he just started talking. SUMMER: So, you know, everybody’s different. So how did you learn how to read? And I just think that’s hilarious, because they think that if you don’t require a child to learn how to read, they won’t learn how to read. Like, are you serious? What 18-year-old is going to want to walk around not knowing how to read a restaurant menu? You think they’re going to lean over and ask their mom to read everything for them, at 18 years old? Who’s going to do that? Or what kid isn’t going to want to go get their driver’s license? And you have to know how to read to get your driver’s license. So, I’m assuming that’s going to happen sometime before that age. But there’s so many things. And for me, I think—well, I’ll start with my oldest brother. My oldest brother had all the pressure from the family members, so he was a little bit timid with things like that. Because people were constantly asking him and trying to get him to read things all the time. Which I think is the huge mistake people make—people are like, “What does that say?” And, “How do you say that?” And, “What is that letter?” And it’s like, that doesn’t really help. That’s not helpful. That makes them self-conscious and it puts them on the spot. And you’re treating them like a performing monkey. And I think that’s what happened with my brother. And he froze up a little. So he didn’t learn how to read until he was a little bit older, and he struggled with it a little bit. He’s also more of the work with your hands type. He’s a sailor, and he sails and works on boats. So he’s not as much the analytical mind, the academic mind. It’s just not his thing. Mine either. SUMMER: And it was because of a certain book. And he wanted to read *this* book. And he asked her, and she sat down with him, and he went through the whole entire book until he could read every word. And that was it. And so, by the time he was five or six years old, he was reading chapter books. And then me, I was just far too busy with other interesting things. I was interested in other things. I wanted to be in nature. I was really into building fairy houses and sewing doll clothes. I was really in my own imagination. I had—I still do—I have a very rich, vivid imagination. And that’s where I spent a lot of my childhood. In nature, and in my imagination. And I think I just wasn’t really super interested. I also had a tendency to not want to do something I wasn’t good at right away. If I can’t get it right the first time, forget about it. (laughs) So I did that with reading. I think I learned sounds and letters when I was pretty young, and then I tried to read something and I was like, “Ack, this is silly. I’m going outside.” I got frustrated. 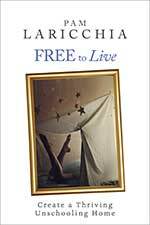 And then, it wasn’t until I was 11, I read Jonathan Livingston Seagull for some reason—I don’t know why, I was bored probably—but we spent a lot of time in libraries as a kid. My mom’s super into books. There were always books around. She always read to us out loud. And we spent a lot of time in libraries. But I wasn’t actually really interested in reading until I was like 11. And then Harry Potter came out. And me being the super fantasy lover, and I didn’t realize that reading was like this window into this whole world of imagination that was beyond magical. So I had a friend—I had a pen pal for a while, and she was like, “Have you read Harry Potter?” And so that’s what got me started. And I could read—it wasn’t that I couldn’t read. I could, but I didn’t read enough to be proficient. I wasn’t interested in it enough to be, like, you know, just read. But my little brother started reading Harry Potter, and that was it. I was like, “Nuh-uh, he’s not going to be reading these big books before me. I’m older.” And then I devoured them. I read all the Harry Potter books. Which is good. It’s great. And I still love reading. I’m busy nowadays, too busy to get any reading done, but yeah. So that’s our story. 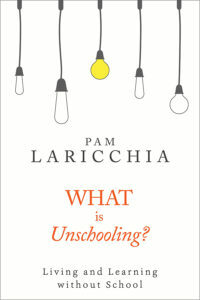 PAM: How about unschooling and reading? Outside of school, learning to read can look so different, can’t it? NIKOLE: It definitely does, and I think a lot of that is because in school, reading education is such a step by step, linear process. You feed children small bites of information and you expect them to incorporate that into their own reading ability but if you are stepping back from expecting it to look the same for each child, it can be so wildly varied how they come to the understanding of reading for themselves. So, my first child, Camille, when she was three and a half, she pretty much started reading. I read to her all the time, I was available for her whenever she wondered “What is that word say, and why does it say that? And what do these letter sounds make?” But I never had the intention that I was teaching her to read, it was just part of our being together. One day, she picked up the book and just started reading where I had left off, totally surprised and amazed and this was a process that she had directed and internalized and sort of brought forth one day. That was really unusual and really surprising to me, so it was fun to see them own that process for themselves, but it did not go that way for all of my children. Sylvia, who is now 11 was not interested in reading for many years, not only not learning at three and a half, but seven, eight, still not really being that interested. We read together all the time, did the same types of activities that I had done with Camille. Sylvia was such a kinetic child and just loved to hear stories and act them out and be expressive, but the sitting down, eyes on the paper, making all of those word sounds come together to make sounds was not her focus. 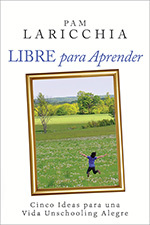 Now, at the age of 11, she had kind of gone from that one point of not only not reading, but not wanting to read, feeling frustrated by that, to just seeing it as a useful tool in her life. Like, she loves to cook, so if she is able to look at a cookbook or a recipe online and figure out how to do that on her own to be able to be independent that way, that was really meaningful to her, so she took the time to sort that out. Looking back, we did recognize that she had a lot of dyslexic traits that probably made it a slower path for her, but it was not a worse path. She was still learning so much every day and getting so much information and experimenting and observing and learning through just a different pathway. Reading was not the only source of that information for her for so long. Ayla is still somewhere in that process. She is seven, knows all the letter sounds, can read words, but does not spend a lot of time with the nose in a book. For each of them to have their own pathway to mastering that and finding its usefulness while also learning so much all the time, without it having to be just from that method, I think has been really empowering to each of them in their own way. PAM: Yeah, I really love that. I love your point that it is not a worse path, just because it takes longer before they are interested and gain the skill or however you want to say it, until they are reading. I mean that was my experience as well, and that was something that I really loved. Once the kids are out of school, and away from that curriculum, equal march, you know, everybody marching and learning the same thing supposedly on the same path, like ‘THIS is this year’ and being judged when they are not. Once you are away from that, you discover the wide differences in different children and you come to embrace that. Some are reading at three and a half and some are 11 and neither one is a worse path, each path is the best for each of them. PAM: I love that so much because outside of school, not reading is not a disadvantage to learning at all. 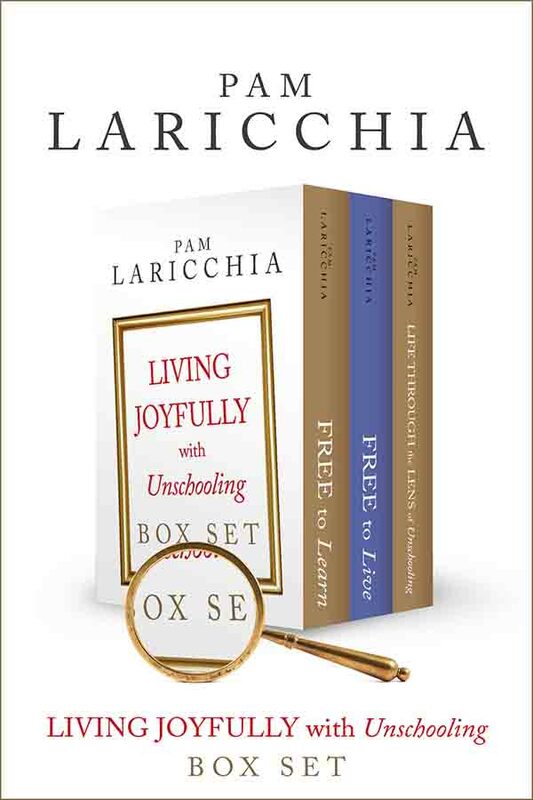 PAM: Because if you are not reading yet, you have other skills that are your forte and you are absorbing and learning through those pathways. And Sylvia has a really strong vocabulary, is my most interested in story-telling child, and so pretty much devoured audio books in the way that a lot of other children would have been reading books. The thing is that it freed her up to be able to move around while she was listening to them and to think about it. Even now she talks about how an author structured a sentence or was able to describe an action in a way that was unexpected. She loves moments in storytelling and did not need to just be sitting, eyes on paper, in order to get that. PAM: That reminded me, because Lissy, too, before she was reading, went through a huge time when she was listening to audio books. She was listening to the Harry Potter audio books over and over, as much of the series that was there. At the same time, she was making those pillows, doing a lot of sewing, she had little vignettes or scenes set up around her room. Like she was doing a million other things at the same time that she was constantly listening to them. So, for her, that was a vital and fun and fascinating part of her journey. PAM: It is so fun to just watch them and see how things develop isn’t it? PAM: Was there a time when one of your kids’ interests really stretched your comfort zone? And I was wondering how you moved through that. PAM: You kept that—buffer is probably the best word for it, right? You kept them in situations where it wasn’t a big deal, and where it would have been a big deal like back to that researching the emotional piece. You took that and focussed on that and just didn’t go into those situations. ALEX: Yes, and the other part of it, the by-product of it was that I got to read to my kids for years. Which is fabulous! We read a lot of books, out loud. So that was fun. PAM: That’s awesome.